Seriously. If you feel stress around your riding partners, trying to keep up, trying to impress, etc., that’s going to put you in a bad place. Ride with people you like, people with similar riding goals who support you and vice versa. You do not need to clip into your pedals. Not to pedal better, not to be “serious,” not for any reason. If you’re worried about your feet, use flat pedals. They aid confidence and build true skill. As a matter of fact, flat pedals are the mark of a true master. Look for a pair of flat pedals with a wide platform and metal pins that stick into the soles of your shoes. Wear skate shoes, running shoes, hiking shoes or best of all- shoes that are made for flat pedals. The vast majority of riders enjoy more confidence, better control and extra fun when they trade their stock 90-100 mm stems for something shorter, say 50-70 mm. The stock setup might feel good in the parking lot, but when trails get gnarly you’ll appreciate the increased range of motion and confidence that a short stem delivers. Quality stems start at $30 and go to over $100. If your handlebars are too wide, you lose range of motion. If they’re too narrow, you lose strength. The best all-around width puts your elbows at about a 45-degree angle from your torso. Try the old motocross test. Get on the ground and do some pushups. Where do your hands wind up? That’s usually a good handlebar width for you. You only use your index fingers for braking. Use the other fingers for holding onto the grip. The first knuckle on your index finger is at the end of the lever. The lever is angled about 45 degrees down from level. Most of you will have to move your levers inward away from the grips. If you can’t reach your shifters, switch them around so they’re between your brake levers and grips. We’re all as fit as our lifestyles allow, right? So let’s get as much power as we can from these bodies of ours. Start with this pedaling tip: As your pedal reaches the top of the stroke, drop your heel. Before 12 o’clock, push across the top from your hip. This will lengthen the power phase and erase the opposite dead spot. By the way, this technique is pedal agnostic. It works great with clips or flats. Suspension, both in the front and back of your bike, is a great way to increase comfort, control, confidence and fun. However, the wrong setup will make your bike handle poorly and it’s really easy to get your suspension settings wrong. Have the bike shop where you bought your bike set up your fork and shock for your body weight and riding style. If they can’t or won’t help you, follow the directions in the manual you got with your bike (or that you find on the frame and fork makers’ websites). Set the sag (the amount your suspension compresses when you’re on the bike) per the fork and frame maker’s specs. Some forks and shocks have markings to help you. Set the rebound as fast as possible without it feeling bouncy. If it’s smooth where you ride, set all compression and “platform” dials to the middle or stiffest setting. If it’s bumpy where you ride, set them to the softest setting. Make sure the front and rear are balanced. They should feel equally soft, and they should rebound at the same rate. Once your suspension feels good, stop tinkering with it and HAVE FUN! If you want to ride a particular section, and you know what to do, and you can see yourself doing it, but you feel nervous, usually a tightness high in your chest, I encourage you to go for it. Nervousness is your body getting ready to perform. If you feel fear, usually in the pit of your stomach, stop! You’re likely to execute some bad old habit, and you’re likely to get hurt. If you’re afraid of something, do not do it. Period. Take the time to set your bike up for you. 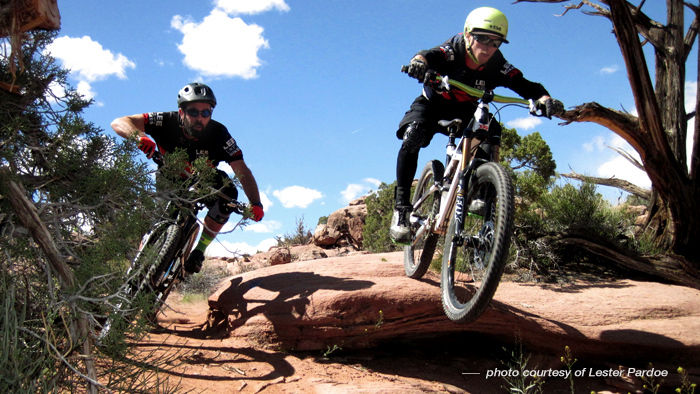 Ride with people you like on trails that are challenging but not scary. Balance on your feet. Have fun!